On this special episode of the Really Awful Movies Podcast, we delve into the Video Nasties phenomenon. The term “video nasty” was a Brit colloquialism which has its genesis in the early 80s, coinciding with the slasher boom. It originally referred to films distributed on VHS that were heavily criticized for their violent content. Some of the films were cut to be able to get a release, while some distributors felt the full brunt of the law. 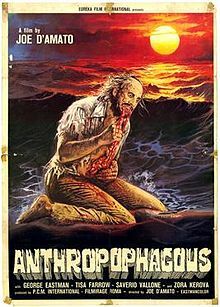 On this episode, we break down some of our favorite (and not so favorite) films from the Video Nasty canonical 72, including Anthropophagus, The Last House on the Left, Bloodfeast, Don’t Go Near the Park, Cannibal Ferox, The Driller Killer and others. We’ve covered lots of these films already on the podcast (such as Don’t Answer the Phone, etc), but have never fully broken down how this came about. We LOVE these movies, and even something as dreadful as Don’t Go Near the Park, is hella fun. One of these days, we’ll have crossed all these films off our bucket list. Don’t forget to check out our Really Awful Movies Podcast, with new episodes uploaded for your listening enjoyment every Friday.